Whether you’re looking for the perfect aesthetic touch or a carefully hand crafted piece to tie a room together, there’s only one natural choice for mirrors in Bermuda Dunes. At Macklin Mirror & Glass we aren’t just skilled at designing incredible mirrors, we provide stellar mirror repair as well. As your full service mirror company we’re proud to service both individuals and businesses in Bermuda Dunes. That’s because we provide the best service with a number of excellent benefits you won’t get with just anyone. As your local supplier of high quality mirrors in Bermuda Dunes, we understand that customers have varying needs. Mirrors vary heavily when it comes to framing and application types between homes and businesses. Mirror installations in a business frequently lean towards panel work of differing sizes while home owners often request custom wardrobe and vanity style mirrors. We have a fabrication facility that’s capable of producing mirrors in nearly any shape and size. No matter what your project or application, we can create a stunning mirror that accentuates its surroundings without overpowering them. Our high standards for materials and craftsmanship ensure our mirrors are made to last. When mirror installation is required, work is overseen by our company owner to make sure the highest quality work is performed. 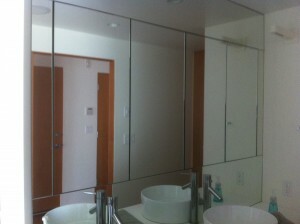 With our custom glass, shower doors and mirrors in Bermuda Dunes, your mirrors won’t just accessorize. Expert level work draws in the eye, and nothing makes a statement like a custom created mirror that expresses your desire for functionality and beauty. Our technicians are highly skilled, our measurements are exact, and we always put the customer first. For incredible custom mirrors in Bermuda Dunes, call (760) 574-3487 or Contact Us today. Bermuda Dunes, CA, La Quinta, CA, Palm Desert, CA, Rancho Mirage and the surrounding areas. © 2019 Macklin Mirror & Glass. All Rights Reserved.